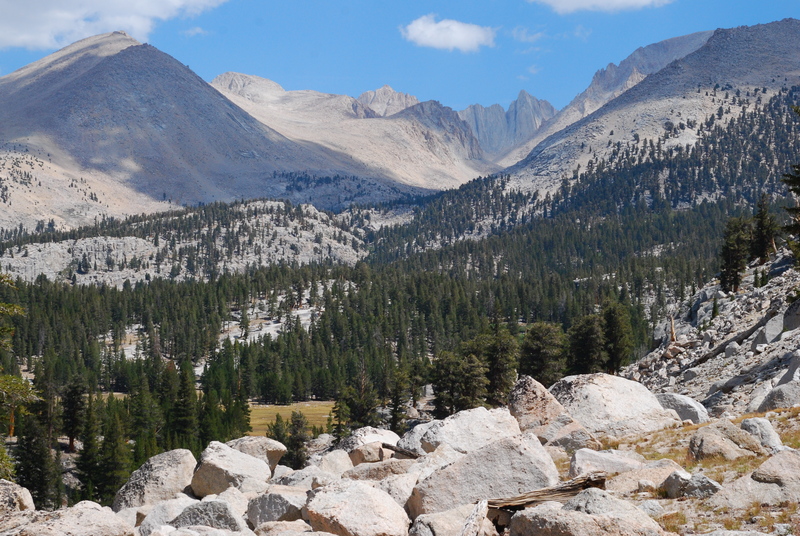 JMT, Day 3: Vampire Cowboys – Hi, Alpine. Our bellies full of coconut oatmeal and brains humming to the frequency of our various powdered coffee concoctions, Robin and I venture out of Rock Creek camp by 6:30, well ahead of the others stationed there still sleepily moving around in their warm clothes. The first pass off the trip – Guyot – approaches immediately and we begin switchbacking up and up, but it feels good today. Really good. My legs are functioning again, finally freed up by the sense that there is truly enough oxygen to go around for all major bodily requirements. I have gone to sleep the past two nights willing my body to become a red blood cell producing machine, and think-not for the last time-how much I feel like a fish learning to breathe air, how fragile and sluggish the past few days have made me feel doing something that usually feels so strong. But today! Today my legs are ready. My heart is pumping, my lungs wide open and unfurling like bellows. 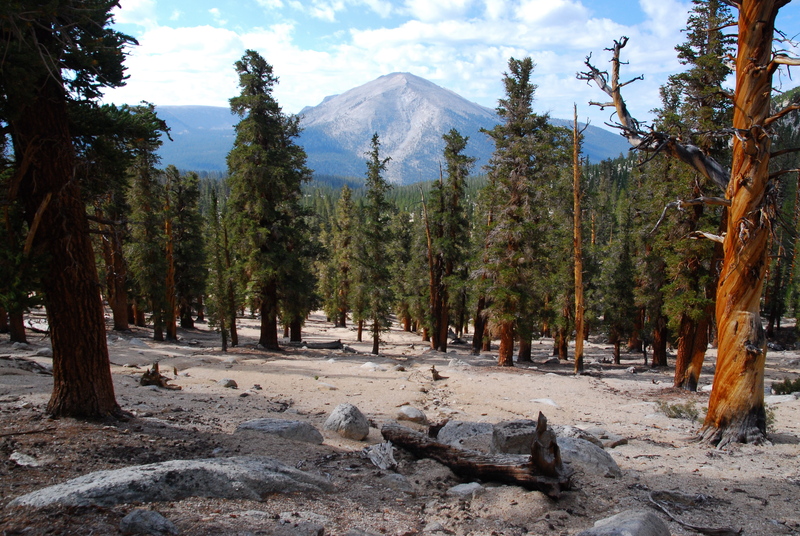 We move up the first part of Guyot Pass to a large, dry plateau of pine trees growing out of rocky sand, then follow some direct but gentle switchbacks to the summit. First pass happy dance and a high five! One down, twelve to go. Maybe after the elevation-induced lethargy of the last two days, we can actually do this. After relishing one of the truly great delights of distance hiking – 2nd Breakfast Snickers – we continue down the other side of the pass to give the approaching voices their turn to enjoy the top in peace. The trail wastes no time dropping us down to Guyot Flats, a perfunctory name that aptly describes the level expanse of sand, pines, more sand, and yet more pines. A man in his early 60s approaches us wearing a large pack stretching from the top of his head down to his knees. We begin to chat and he explains that he is out finishing a five-day hike just to see if he could still do it. “I researched assisted pack train trips. They are expensive,” he says. He pauses for a moment, then continues: “…but I’m rich so I don’t care!” He opted instead for a solo trek to earn full bragging rights for carrying his own gear. The man, who we refer to as Billy Rich, asks to take our picture and we oblige. Robin snaps one of him, too, and we wish each other happy trails as we continue along our opposite trajectories. Later in the morning, we stop for some more sunscreen and a brief leg rest. A pack train approaches and passes, the same that we’ve been leapfrogging since Chicken Spring Lake. The leader rides a tawny horse and he looks astonishingly like he could be en route to the 1849 Gold Rush. He looks and sounds the part of grizzled cowboy down to the bushy white mustache and drawling intonation. I am fascinated with him, and have been referring to him as “Wyatt.” It’s like if you took Sam Elliott as “The Cowboy” in The Big Lebowski, hit his face with some 40-grit sandpaper, and put him in dusty leathers. The man does not look of our time. His mustache is admirable, snowy, and luxuriant. I am obsessed. I’m getting really worked up now. I stop to take a breath and notice that Robin has shouldered his pack at this point and is giving me the long-suffering spouse look while chuckling to himself. It should be noted that my exposure to cowboys is largely limited to “I Wanna Be A Cowboy” by Boys Don’t Cry, which, as we all know, achieves total verisimilitude. Um. Our flat trail winds around a corner and all of a sudden the pines (and trail) drop away to reveal the Mt. Whitney complex of mountains – Mounts Young, Hale, Whitney, Russell, Muir, and Hitchcock, among others – giants looming over a landscape that now looks very small in comparison. We settle on a rock in Crabtree Meadows that affords a perfect view of the mountains, taking them in over rehydrated black beans and tortillas. Robin goes an elegant seasoning route with cumin and coriander, while I dump enough Hot Taco Seasoning in my beans that they actually glow a ruddy orange. Delicious. Well, mine is. Robin, despite his seemingly moral objection to taco seasoning, seems suddenly very interested in my leftover beans, which I’m scooping up with dehydrated mango slices under the rationale that it’s like an alpine mango salsa and bean dip. Robin looks horrified, but hiker hunger works in mysterious ways and I stand by this flavor combination. “Mumble mumble might mumble taco seas….mumble mumble,” Robin mumbles. “I…might look for some taco seasoning in Independence,” Robin admits, still mumbling, a concession of my bean seasoning victory if I’ve ever heard one. 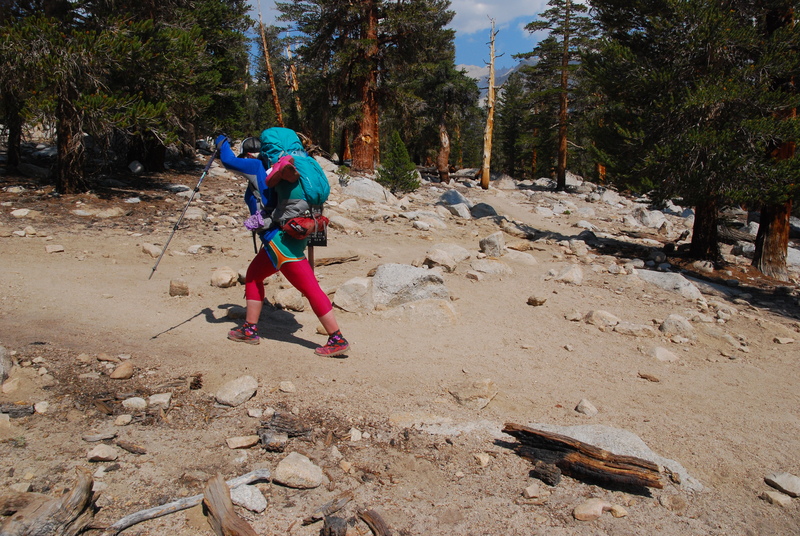 After lunch, the trail leads us up a wickedly steep and hot .7 mile stretch to connect us to the John Muir Trail proper. We pass another pack train and, I am not kidding, the leader looks like another 19th century escapee, but with the added bonus of sporting an eye patch. I couldn’t make this up. We reach the junction, which I cross with a showy, overblown stride of triumph. It feels like a big moment to stand on the official trail that we won’t really leave for the rest of the trip. One line, one trail. One foot in front of the other. Over and over. It is a somewhat arbitrary labeling distinction since we’ve been on the PCT this whole time and will continue being on the PCT until a few miles at the end, but still. It seems significant, so I celebrate. Near Sandy Meadow we run into a young couple headed southbound. “How is the smoke?” we ask, the question becoming a kind of reflex that can’t be stopped from escaping our mouths after saying hello. We needed to hear this so, so badly. The smoke has taken on its own life. It’s a specter haunting the trail, promoted to proper noun status. The Smoke. We’ve tried to stay optimistic, but I know the smoke rumors have frayed our confidence a little bit. Our newfound cheerleaders lifted us in a way that they will never know. And we are so grateful. We continue down the trail, hopeful. Our formerly clear day has given way to The Smoke. 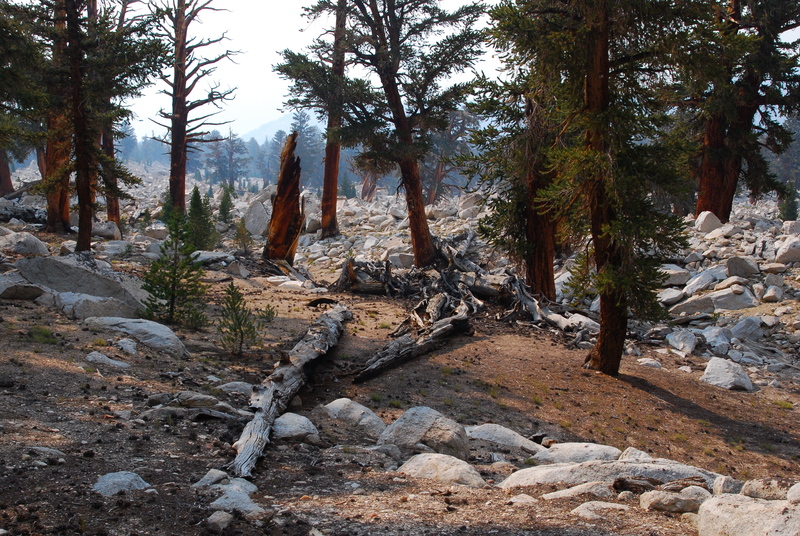 It grows heavier the further into The Boneyard we walk and sits heavy and thick over the Wallace Creek drainage we’re descending into. The sun is a matte red disk and the evening sky a dingy shade of mauve. 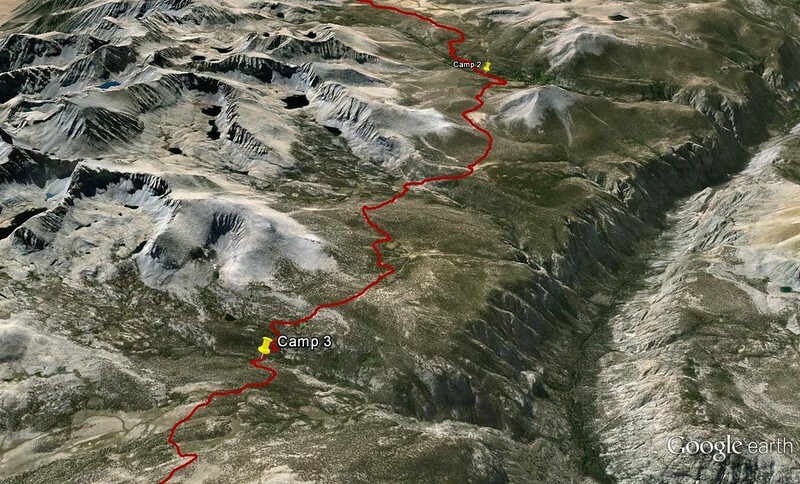 We set up camp at a spot tucked upstream from the Wallace Creek crossing, quiet and private. We find a sandy spot adjacent to a nearby meadow where we cook dinner, freeze dried yellow curry, rice, and chickpeas, which tastes way better than expected much to our delight. A doe wanders out of the forest across the meadow, regards us with her enormous ears flared out, then sinks to her front knees before laying all the way down. She is very close and I’ve never seen a wild animal in a relaxed pose like this, aware of us but wholly unconcerned. It is surreal. After we’re all done eating (us the curry, the doe some cud), the deer rises and ambles back into the woods. It’s time for us to retire, too, so we seal ourselves in our little fabric shell and drift off to sleep.